Pine Tree Quilt Guild of Nevada County is having their annual quilt show this coming Saturday and Sunday, May 1st and 2nd, at the Nevada County fairgrounds in Grass Valley. I understand this is a wonderful quilt show with well known quilters living in the area participating. Elisa and I are going tomorrow. Hope to see you there. I will write about what we saw and did there later. This has been a busy week in quilting for me. I was supposed to go to a quilting group on Monday, but I stayed home and finished piecing a quilt top that I started in February. I decided I want to applique some vines and leaves or flowers on the sashing. I will present it when it is totally done. Tuesday I sewed a binding on a quilt going to Quilts for Kids - Davis Chapter. They had given me six quilts to quilt for them. I finished them and gave them all back to them for distribution. Then I quilted a quilt for Project Linus. That evening I sewed a binding on a quilt I made last fall. It was quilted and everything, just needed the binding. Wednesday I returned two quilts I had quilted for Project Linus. I also gave them the quilt I had made and did the binding on yesterday. She in return gave me two more to quilt and one for Elisa to quilt. Then I quilted a cheater quilt for the Flying Needles Quilting Guild. It was easy because it was small. 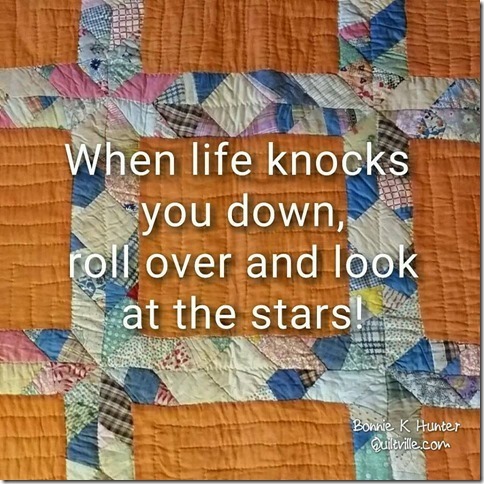 The fabric they gave to me looked like a crazy quilt, so I just added backing and batting and quilted it. Now I have to put some binding on it. Today I got up earlier than normal. I decided to put one of the small quilt tops I received from Project Linus yesterday on the short arm on long table Elisa let me borrow. It is great fun to sew on it. By doing community quilts, I am learning how to use it better. And they are keeping me busy with them. I was able to quilt one quilt before 8:30 a.m. today. Ann from Project Linus came back today to give me that one of the quilters wanted me to quilt. I gave her back the one I quilted this morning. Then I started another one of theirs and finished it around 1:30 p.m. I started to put a quilt on that I am putting together for Flying Needles. Hopefully I will have that done before evening. Then I will try to get the binding on the two I have done for the guild. See why I said I have been busy? It is fun, though. I hope you are enjoying your quilting projects, too. If it is not fun, then why do it? Yesterday Elisa and I went to a few of the shops on the Renegade Shop Run. Well actually it was only two. We spent too much time at one and had to move on to other scheduled activities. First we went to Bear Paws and Hollyhocks on El Camino in Sacramento. Darling shop. If you have not been there, you must go. Lindy has it all displayed nicely and has a huge selection of most any quilting cotton you would want. She also has a section that has fabrics at 40% off. I was able to purchase three yards for backing material at a great price. Then we went to JR Flamingos, also in Sacramento. It is actually quite close to Bear Paws and Hollyhocks, so if you go to one make plans to go to the other. It is very small, but it has a HUGE selection of Asian fabrics. They have a lot of other beautiful fabrics, too. Best of all they have fabric art supplies galore. I do not know how to use most of the supplies. They have a teacher that will schedule a class that teach you the techniques of all of the supplies. That way you can see if you like to do the technique without having to buy all the supplies first. You have to call and get on a waiting list. When she has enough students, then she holds the class. I am going to check into that class. I may not ever use any of the techniques, but I may fall in love with them. I just want to have the chance to see the advantage of each one. Then we were headed to Quilter's Corner. You have to take Bradshaw off of Highway 50. Well they had the exit blocked off for construction. By the time we got to the next exit to turn around and circle back, we figured we would be late for a dental appointment. So we drove on into Citrus Heights to have lunch. We had a great lunch at a new hamburger place called Smash Burgers. Oh my goodness, was that a wonderful lunch! We had their classic cheeseburger and Smash fries. Try them both. The fries are sprinkled with Rosemary and olive oil. Yummy! I would go back today for that same dish. They have a lot of other choices on the menu, too. The only thing I saw wrong with the place is it is too small. It was filled and many people had to eat outside at their tables along Sunrise, and it was not a warm day. Gotta go there. Check out http://www.smashburger.com/. It is located at Sunrise Blvd & Pebble Beach Dr.at 5500 Sunrise Blvd. in Citrus Heights. After we saw Tayo's we were finished. It had been fun, and we were sorry we did not make it to other shops. But we both have enough fabric to last us a looooong time, so we really did not need to be purchasing more fabric. So into the car we went, happy and tired. Then the car would not start. That was about 2:25 p.m. By the time we got AAA out there, it was after 5 p.m. So we sat out front of Tayo's on one of their benches and watched the roosters wander back and forth across the street. It was not too bad. I enjoyed it anyway. Got home finally but I missed the first hour of Yolo County's quilting guild. I went anyway and was there to see the last part of Nancy Candello's trunk show. She is a premier quilter and teacher. She taught at Beehive Quilts store when it was opened. I love Nancy and her work. 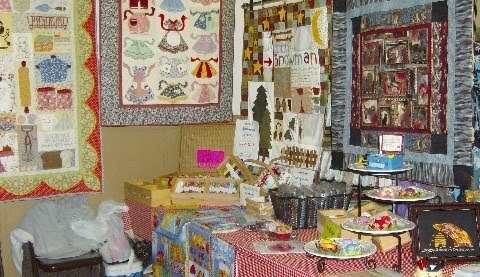 Last weekend was Auburn's Quilt Show. It was tremendous. Elisa and I were there as vendors representing Beehive Quilts. We did very well, thank you. We also got to see a lot of people we know, which was great fun. I bought way more than I should have. Owning fabric is an obsession. Now I just need to do something with all of that. The best part was two people had something I wanted and I had something they wanted. I had never thought of trading before. They suggested it. It worked for all of us. I wound up with a great book on how to use my fabric calculator, and it was signed by the author! I hope to carry both the calculators and the book on my website soon, so watch for them. The other trade I received a great pattern for a quilt that has a lighthouse, shoreline and Cape Cod-type houses. I have seen it made up. Now I can make it, too. I did not take pictures of any of the quilts. I apologize for that, as they had some great quilts on display there. My favorite was a group effort wall hanging. Four ladies each took one house from San Francisco and made it into a thin long quilt. Then the four quilts were hung together as one quilt. The houses in question are the Painted Ladies, which is a row of terrific-only-in-San-Francisco houses. If you have seen pictures of SF, you have seen these houses, I am sure. The replication was just beautiful. One of the teachers from our shop was represented there. Laurel Anderson was there. She mentioned she had a quilt entered in the show. I went over to see it. It took 1st place in the category it was entered AND it took first place in viewers choice. It was a stunning quilt. I contacted Laurel today, and she sent me a picture of it. She also stated she will teaching how to make this quilt at Bear Paws and Hollyhocks in Sacramento. Her classes fill up fast. Contact them to sign up soon. You can check out the other items she has done on her website at http://www.whispercolor.com/index.html. Great weekend. This weekend, actually starting tomorrow, is the Renegade Quilt Run. It is the one our shop was involved with last year. Great fun. I tried to find exact information to link you to. All I found were shops saying it was this weekend. I did find my listing from a year ago showing what shops are involved and where they are located. 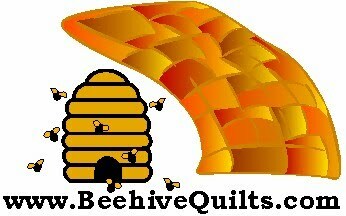 You can find that at http://www.beehivequilts.com/renegaderun. Just remember Beehive Quilts in Woodland is no longer opened. So do not drive all the way there. I am pretty sure the others are still part of the run. I know Bear Paws and Hollyhocks and Runs with Scissors is. Go and have fun. Check out the following link. Pretty cool story. I love that men are getting involved in quilting more and more. It gives quilting a more mainstream reputation. Thank you, Trina, for sending me this link.